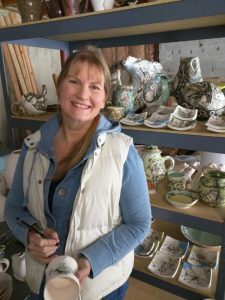 Award-winning ceramics artist CJ Niehaus is coming to Rosewood later this month. She talked with our social team about what inspires her to create artwork, how she got started as an artist and why she loves teaching others to create. 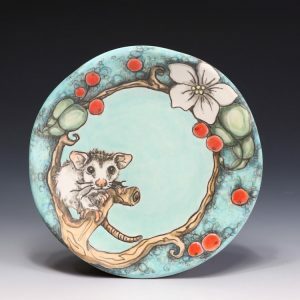 What was your first experience with ceramic art? What inspired you to decide to pursue it professionally? Niehaus: I dabbled a very little bit in high school, but it wasn’t until I was in my final semester of my Bachelor’s program that I was smitten. I was in a program for Art Therapy at Xavier University in the 80’s. I had taken all the art classes, drawing, design, painting, sculpture, etc. etc., but had left clay for the last. I didn’t have an interest in ‘making dishes’, but it was required for the Art Therapy degree. So, right before graduation, I found myself totally absorbed by clay! I think every clayworker will say they became addicted. It was that way for me, too. It is so immediate and kept me present. My hands in it, shaping it, developing a relationship with the object, clay answered something deeply in me. So, after graduation, I went back and took two more semesters in it! I’ve worked in clay since the 1980’s in varying degrees as I raised my children and moved to different cities. Clay gave me myself. It wasn’t until a series of unfortunate events in my mid-forties that I went back to school to work on my MFA and started teaching at the college level. Going back to school was something I had wanted to do and I just had to wait 23 years for it. Can you discuss the influence of nature on your work? What types of natural images or experiences have shaped your artwork the most? When I returned to school as an nontraditional student, I was facing a rebuilding of my life. So many times, we perform the roles that society, family and our beliefs tell us are ours. As these structures fell apart, I had to question who I really was. It had been so long since I had been just me. So I went back to my childhood to start over. I was the only child for years in my neighborhood, and we had a great big backyard with a creek in it. I played all day in this yard, digging in the dirt and catching crawdads. My imagination was free to invent and explore. I loved my yard, my trees and my critters. So my MFA work began to reflect this. Certain animals started to reflect different people in my family and different times in my life. These beings felt authentic to me, and the work became personal. I still gravitate to natural areas to ‘refill’. I am nourished by the spaces that contain my extended family. What has been one of your favorite experiences as an artist and/or as a professor of art? What do you enjoy about teaching ceramics? So many little things. I just started back to school last week, so I am thinking so much about my students right now. Seeing my returning students come back, excited and full of ideas is the best. When they come in wanting try something new or put together ideas in a new way, that is so gratifying. I see their passion and can’t help but feel that I am a small part of it. Last night, one of my students was quietly and happily singing to herself while working on the wheel and it was so unlike her when she started taking classes. I can’t help but be happy about being a part of, not only growth in skills, but growth in people. 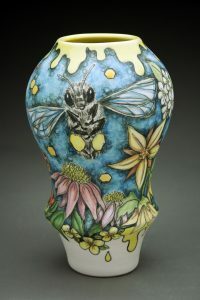 Is there any aspect of being a ceramics artist that you find particularly challenging? Time! I need more time! I want to stay true to my work, but it is very time-intensive, so I don’t do the experimenting that I want to do. I see so many great ceramic artists out there and want to take workshops and learn new things, but it is tough. I do a little here and there, but I need to do more. So many! Kurt Weiser, Sergei Isupov, Edward Eberle, Robert Arneson, Toshiko Takaezu, Beatrice Wood, Dr. Suess, Hieronymus Bosch, on and on and on! Don’t miss the opportunity to meet and learn from CJ Niehaus this month. Register for her workshop before it’s too late!